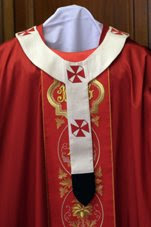 The new metropolitans won't be the only ones donning a new pallium come Sunday -- on the initiative of his "new Marini," B16'll be getting one of his own. At the formal inaugural of his Petrine ministry five days after his election, Papa Ratzi was invested with a distinctively-crafted band more reminiscent of the vestment's earliest, more function-based forms than its ceremonially-inspired contemporary look. As the then-MC Archbishop Piero Marini explained it at the time, the break from modernity was intended as a sign to further ground the office's visual character in its pastoral roots; in his first public homily on Peter's chair, the Pope himself added that the garment was "a symbol of the shepherd’s mission. "This ancient sign, which the Bishops of Rome have worn since the fourth century, may be considered an image of the yoke of Christ," Benedict said, "which the Bishop of this City, the Servant of the Servants of God, takes upon his shoulders. God’s yoke is God’s will, which we accept. And this will does not weigh down on us, oppressing us and taking away our freedom." Unveiled by Guido Marini in the pages of yesterday's L'Osservatore Romano, the latest re-design (above) hews closer to the form currently in use, albeit slightly longer, wider, and bearing red crosses as opposed to black. In his interview with the Vatican daily, the new MC said that the change was motivated both to "underscore the continuing development" of the vestment from after the demise of its longer form in 1219, and "the practical," in that, according to "Marini II," his predecessor's design had caused "many troublesome problems." In other words, it couldn't be worn with fiddle-backs. "The different form of the papal pallium relative to that of metropolitans," he added, "puts in perspective the difference of jurisdiction [universal vs. local] that is signified by it." To say nothing of the fact that the 2005 rehash couldn't be worn with fiddle-backs. In other news from the chat, the regnant MC -- whose most recent fine-tune to papal worship was the introduction of pre-dieus f0r the distribution of the Eucharist to kneeling communicants -- said that the change was foreseen as a permanent one. "The form adopted by Benedict XVI is extended to underscore the normative manner valid for all the church," Marini explained, noting that "from the juridical point of view" the reception of communion in the hand "remains even now... an indult to the universal law, conceded by the Holy See." While taking communion on the tongue has long been Vatican protocol when receiving from the Pope's hand, Marini added that the restored form "shines a better light on the truth of the real presence in the Eucharist, helps the devotion of the faithful, introduces with better ease the sense of mystery." All these, he said, "pastorally speaking, are urgent to emphasize and recover in our own time."